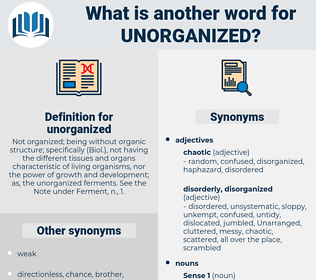 What is another word for unorganized? Not organized; being without organic structure; specifically ( Biol. ), not having the different tissues and organs characteristic of living organisms, nor the power of growth and development; as, the unorganized ferments. 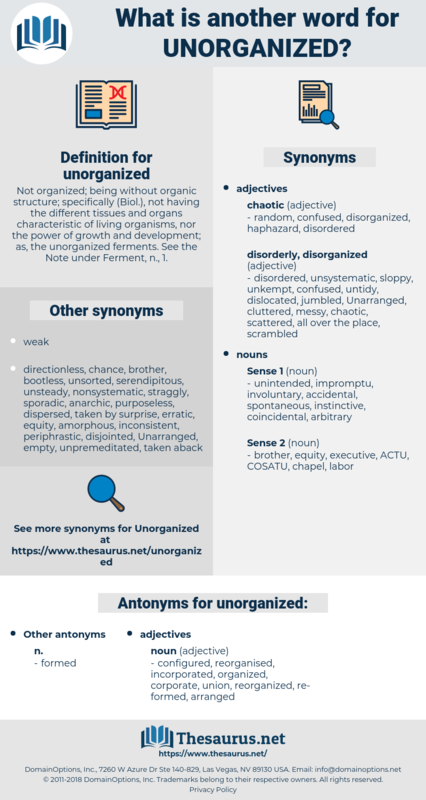 See the Note under Ferment, n., 1.
configured, reorganised, incorporated, organized, corporate, union, reorganized, re-formed, arranged. We had already adopted the order and customs of our Church at home, so far as they could be adopted in an unorganized Church. If extensive groups of men remain unorganized, the responsibility lies partly on the trade unions, and is partly conditioned by our social and political environment.